Visit Phoenix is a not-for profit organization headquartered at 400 E. Van Buren St., Ste. 600, Phoenix, AZ 85004, USA. 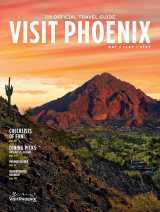 Visit Phoenix (“Visit Phoenix,” “us,” “we,” or “our”) is committed to online privacy. This notice details how we collect, use, share, and protect the personal information that users share with us on our website, located at www.visitphoenix.com, or any other website operated by Visit Phoenix (each, a “Website”). It also sets out the users’ rights in terms of data protection. Visit Phoenix reserves the right, at any time, to modify this Privacy Notice. If we make revisions that change the way we collect or use personal information, we will post those changes in this Privacy Notice. We do not collect any personal information through the Websites except that knowingly and willingly supplied by the visitor for the purpose of providing the services/information requested through our Websites. We will collect personal identification information from users based on their express consent, in other words only if they voluntarily submit such information to us. Personal identifying information may be collected through e-newsletter forms, online request forms (such as a travel guide order form), contests, feedback forms, and surveys. Any information that the customer provides, such as name, address, email, and ZIP code and phone number will be stored in a secure location and will be used only for those purposes stated. When you choose to submit such information, you are transferring that information into the United States of America and are consenting to such transfer. All data transferred will be/is encrypted (Hypertext Transfer Protocol Secure, or HTTPS), through Secure Sockets Layer, or SSL. Visitors can always refuse to supply personal identification information, noting that choosing to do so may prevent the user from engaging in certain site-related activities. Users of our services, such as e-newsletter subscriptions, may also withdraw consent for the use of their personal information at any time. Visit Phoenix participates in behavioral-based advertising. This means that a third party may use technology (e.g., a cookie) to collect information about your use of the Website so that they can provide adverting about products and services tailored to your interests. That advertising may appear either on the Website or on other sites. To review, update, or delete your collected data, or to withdraw consent for use, contact privacy@visitphoenix.com. We automatically receive and collect certain types of information whenever a user visits the Website. For example, like many sites, we use "cookies" and web beacons and obtain certain types of information when your browser accesses our Website. When you visit our Website, you will be assigned a "cookie", which is a small text file generated by a site’s server and placed on a user’s hard drive. Cookies enable our Website and your browser to interact in such a way that the Website is able to present you with the most appropriate options and to customize services to your interests based on your previous use of the Website. For example, a cookie can be used to store registration information in an area of the Website so that you do not need to re-enter it on subsequent visits to that area. Our website includes social media programs and features, such as UGC (user generated content) powered by CrowdRiff, the Facebook Like button and widgets, and the Share button. If you choose to use these features, they may collect your IP address, which page you are visiting on our Website, and may set a cookie to enable the feature to function properly. The social media programs, features, and widgets we use are either hosted by a third party or hosted directly on our Website. Your interactions with these features are governed by the privacy notice of the company providing the feature(s). 2. How and Why Do We Use Your Information and How Long Do We Store it? Visit Phoenix will retain personal data we process for no longer than is necessary for the purposes for which we process the data or until the visitor/user notifies us that he/she no longer wishes to receive the services or information for which the data was collected. Visit Phoenix will retain and use this personal information as necessary to comply with our legal obligations, resolve disputes, and enforce our agreements. Visit Phoenix employs reasonable security measures to protect personal information from becoming disclosed to individuals who are not described in this Privacy Notice. While there is no such thing as “perfect security” on the Internet, we will take reasonable steps to ensure the safety of your personal information. No guarantee can be made that your information and data will be secure from intrusions and unauthorized release to third parties. You have the right to review, modify or erase your information at any time. If you would like to review your information within our contacts database, update it, or remove it, please contact privacy@visitphoenix.com. Visit Phoenix allows users to opt out of receiving e-mail from our partners or us. To opt out of our mailing list, please click here to email Visit Phoenix&apos;s marketing department. Every email we send includes a link to opt out of future mailings. We have no control over e-mail promotions that you may receive from third parties. This Privacy Notice applies only to personal information collected while a user is on the Website. This Website contains links to other sites. Visit Phoenix is not responsible for the content or privacy practices of these other sites. Users are encouraged to read and become familiar with the terms of service and privacy policies maintained by such other sites. Some of the features on our Website may enable you to post or view content on social networking sites (e.g., YouTube, TripAdvisor, OpenTable, Instagram). You acknowledge and agree that you are solely responsible for your use of those sites and that it is your responsibility to review the terms of service and privacy policies of such sites. We will not be responsible or liable for: (i) the availability or accuracy of such sites; (ii) the content, products, or services on such sites; or (iii) your use of any such sites. Under California Civil Code sections 1798.83-1798.84, California residents who have an established business relationship with Visit Phoenix are entitled to ask us for a notice describing what categories of personal customer information we share with third parties for their direct marketing purposes. This notice will identify the categories of information shared with and will include a list of the third parties with which it is shared, along with their names and addresses. If you are a California resident and would like a copy of this notice, please submit a written request to us at the addresses listed below. In addition, if you are a California resident under the age of 18 and are a registered user of the Website, you may request that we remove content or information about you that you posted on the Website by (A) submitting a request in by email to privacy@visitphoenix.com and (B) clearly identifying the content or information you wish to have removed and providing sufficient information to allow us to locate the content or information to be removed. However, please note that we are not required to, and may not be able to, erase or otherwise eliminate content or information if (i) other state or federal laws require us or a third party to maintain the content or information; (ii) the content or information was posted, stored, or republished by another user; (iii) the content or information is anonymized so that you cannot be individually identified; or (iv) you do not follow the instructions posted in this Privacy Notice on how to request removal of your content or information. Nothing in this provision shall be construed to limit the authority of any law enforcement agency to obtain the applicable content or information. We do not knowingly or intentionally collect any information from children under the age of 13. If you are an EU resident under the age of 13, you may look at our Website but you may not register or submit any personal information to us. If we become aware that we have inadvertently received personal information from an EU resident under the age of 13 on the Website, we will delete the information from our records. Alternatively, EU residents may also raise complaints with the local Data Protection Authority (DPA). If Visit Phoenix needs, or is required, to contact you concerning any event that involves information about you, we may do so by email, telephone, or mail. We reserve the right to change and update our privacy notice. Any changes to our notice will be posted on this site. Last updated: 05/31/2018.